After a tumultuous few episodes, The Great British Baking Show returns to its typical approach with “Sweet Dough,” for better and worse. The episode begins with a brief refresher, catching viewers up on the non-elimination in “Pudding,” and the high stakes the bakers face this episode: two contestants will be going home instead of the usual one. The camaraderie strengthened by the strudel stay of execution is apparent right from the top. Several bakers feel confident they could have gone home last time, and therefore are grateful for the chance to prove themselves once more. Their enthusiasm is to be expected; more heartwarming is the excitement from Mel and Sue, who are clearly very happy to have all seven contestants back for one more week. The signature challenge is a straightforward one, with the bakers tasked with making 24 yeasted buns. They can be in pretty much any style, but they must be uniform in size, shape, and color, and the judges will be paying particular attention to the bakes’ texture. As the contestants get to work, Mel walks the audience through the definition of enriched dough and lists off examples of different British buns. 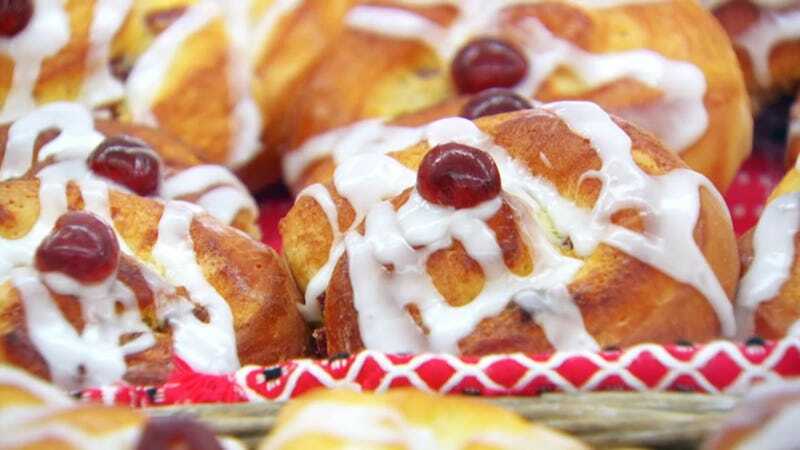 The names will be familiar to anyone who’s watched a fair amount of Baking Show and are commonly known to the original intended audience, but American viewers can be forgiven for losing track of the differences between Chelsea buns, Bakewell tarts, and the other more specific types of buns made by Cathryn, Ryan, and Sarah-Jane. Chelsea buns appear to be quite similar to cinnamon rolls and viewers of Baking Show season four will remember the “Pastry” technical challenge to make a feathered Bakewell tart, but as for the other three, the audience is left mostly in the dark. While Cathryn and Paul’s brief sparring over the history of Lady Arundel’s Manchet Buns is charming, a brief pause to fill viewers in on their flavor profile or characteristics would not have gone amiss. Even with four bakers opting for Chelsea buns, this is a strong signature challenge. There’s plenty of flavor flexibility and because of the multiple proofs yeasted buns require, the bakers are constantly at work, rather than hovering over their proving drawer or oven. With a full hour left, Ryan is already scrambling and a half-hour out, Brendan has only 90 seconds to spare. Creativity, precision, and care, this challenge has it all, and it doesn’t hurt that the buns each of the bakers present look absolutely scrumptious. Less delectable is the decision to break up this segment of the episode with clip reels for each of the bakers. The producers are looking to goose the coming double elimination by reminding the audience of each baker’s high- and low-lights, but they split the brief reels between shots of the bakers at home and one or two moments in the tent. The result is fractured and underwhelming, taking viewers out of the action in the tent when a simple anecdote or aside from each baker about why they chose their flavors or the memories they have of this homey signature bake would have been much more effective. The three hours for the signature challenge are over in a flash, and with judging comes a season milestone: the first Paul Hollywood Handshake! Several of the bakers do well, particularly Danny, James, and Brendan, but it’s Ryan, who was so worried about his time, that earns the coveted honor for his lardy cakes. Paul is practically giddy as he bites down and both he and Mary compliment the soft texture and taste. As he was in “Pies,” Ryan seems befuddled. He’s not sure how to process positive feedback and seems more wary than he was before judging, not trusting his good luck. Unfortunately, Ryan’s foreboding proves well-founded (or was self-fulfilling), and he struggles in the technical challenge, which tasks the bakers with making 10 jam doughnuts. As with the signature challenge, the judges focus in their talking heads on texture and the tricky wet dough the bakers will need to work with, but not over-work, to achieve the doughnuts’ desired lightness and rise. Surprisingly, only James has experience making doughnuts, and it’s entertaining to watch the bakers struggle with and question their dough in exactly the way the judges anticipated. Both Danny and Sarah-Jane demonstrate some handy dough-shaping techniques that this at-home baker will remember for future reference, but on the whole, it’s an unremarkable technical, and likely because of that, the episode cuts away for the second historical segment of the season. Unlike Mel’s eel pie adventure, Sue’s background on the American Red Cross’s World War II doughnut trucks and Doughnut Dollies is directly connected to the task at hand. The segment is engaging and specific and the clear tie to the technical allows for organic transitions into and out of the segment. It’s a neat aside, well-paced, and obscure enough that it may be entirely new to modern audiences, particularly in the U.K. However, the segment skips right over the most interesting part of the Doughnut Dolly story, the decades-long backlash that the Red Cross faced after implementing a fee for their coffee and doughnuts in 1942, at the behest of the U.S. Secretary of War. This is not necessarily in keeping with the light and breezy tone of the rest of the episode, but it’s a shame Sue’s history lesson ends right before its most intriguing chapter. Back in the tent, after judging the technical (a strong 1-2 finish for James and Danny, and an ominous 7-6 finish for Sarah-Jane and Ryan), the bakers roll up their sleeves and get right back to work on the showstopper challenge. They must make celebratory enriched dough loaves, and certain recipes require proving the dough for 12 hours or more. Only a few of the bakers take advantage of the opportunity to proof their dough overnight and when the bakes wind up somewhat disappointing, it’s hard to know how much of this is because the bakers chose poorly with their recipes and should have been more ambitious, or whether they just failed to execute solid ideas. John is one of the bakers to attempt an overnight proof, but he’s unsatisfied with his results and winds up binning his dough and starting over. It’s good that he is able to pull something else together, but if the first chunk of the baking time isn’t completely necessary, why include it? The next morning, the bakers dive right in and their bakes start to take shape. Sarah-Jane plaits a lovely loaf, Brendan pulls out a bundt pan for his Black Forest-inspired stollen (and throws a little sass the judges’ and hosts’ way about their ‘70s digs), and Ryan introduces Paul to char siu bao, pork-filled buns that are a staple of Chinese New Year. Ryan’s the only baker going with a savory recipe and he has the potential to really stand out, but come judging, his bake is not only raw inside, it’s utterly lacking in any presentation value, a no-no for the showstopper challenge. Sarah-Jane similarly struggles, her beautiful plait ripping in the oven and winding up overcooked on the exterior and raw inside. Danny and Brendan both turn in terrific bakes, and Cathryn skates by with a tasty, but rather cake-like brioche, but the rest of the bakers limp to the finish and this makes for a muted end to what could have been a dramatic and incredibly satisfying two-parter. When the results come, it’s clear it’s time for Sarah-Jane and Ryan to go. Sarah-Jane has been in the bottom for weeks and hasn’t been able to get out of her funk, despite her many delightful talking heads, delicious-sounding recipes, and utterly relatable persona in the tent. Ryan has had tremendous highs, but success has only unnerved him and thrown him off his game, causing him to be one of the most uneven bakers all season. He actually seems more at ease after having been eliminated than he does after earning a Paul Hollywood Handshake. On the happier side of the spectrum, Danny earns Star Baker for the very first time and is on quite the upward trajectory. Heading into the quarter finals, Brendan and Danny are definitely the front-runners, with the other bakers nipping at their heels. The top five have each shone at different points in the season and most have also struggled, so who makes it through to the semi-finals and then the final will likely come down to who has a good week, and who has an off week. Until then, a fond farewell to Sarah-Jane and Ryan, and hold onto your milk, because up next is biscuits*. *Cookies, or crackers. But mostly cookies. Thank you to the commenters who chimed in with explanations of British pudding in the previous episode’s comments section! I’m both more and less confused about the term and its etymology. John is still wearing a glove on the hand he cut in “Pudding,” a full week later. Damn. I love that Cathryn claps back at Paul that she knows her baking history, thank you very much. Watching her gain confidence and stand up for her signature bake (her buns may not have been uniform, but I’m with her, they definitely weren’t burnt) is one of the episode’s biggest pleasures.